Tornado Black made it to the final of the US Open girls' junior tournament earlier this month and says thanks but no thanks to comparisons to Serena Williams. Led by her 15-year-old daughter, Gayal Black was taking her first walk through Times Square last week when she realized that things had suddenly and perhaps forever changed. 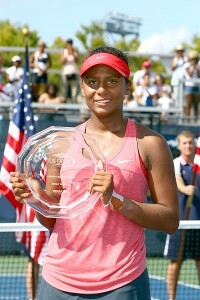 "People came up to us and recognized her," Black said of her daughter Tornado Alicia Black, who had reached the final of the US Open girls' juniors the day before. "It was so shocking." Not so shocking, however, that Tornado did not know how to respond. "She said thank you and shook their hands," Gayal said. "My kids have seen top players who are snooty and don't want to sign autographs. But they know you stand there until all the children, at least, have their autographs signed. They came to see you and they're going to be the ones in the future who are going to buy tickets to see you." While the blossoming of Tornado Black as an up-and-coming tennis star is just beginning, the marketing of the teenager from Boca Raton, Fla., has been a long time in the making. Gayal Black, who also has a 12-year-old junior champion in daughter Hurricane Tyra Black and another former player in 26-year-old daughter Nicole Pitts, said she does not want her younger girls referred to as "the next Serena and Venus Williams," as they have been. But it has less to do with racial stereotyping than it does with carving out their own niches both on the court and in endorsement circles. Gayal Black said she knew she had a champion in the family when Tornado was 3. "It's hard to get sponsors because they're so used to everyone saying, 'I have the next Venus and Serena,'" Gayal said. "But honestly, out of everyone saying that, no one is proving themselves like Tornado and Hurricane. It's so much more than striking tennis balls, and both girls have proven that." At 10, Tornado won the 12-year-old Nationals. At 12, she won the 14s. Hurricane just won the USTA Girls' 12 Super National Hard Court Championships in August and is the top-ranked 12-and-under girl in the country. "We're always going to be compared, but we're the Black sisters not the Williams sisters," Gayal said. "We're going our own way. We played the junior ITF circuit, the Williamses didn't. It's nice [for Tornado] to be compared to Serena, who's the greatest of all time, but they want a name for themselves and I think they'll live up to their own names and win their own Grand Slam titles in years to come." Living up to their own names is a big enough chore in itself with monikers like Tornado and Hurricane. But it was not without considerable thought that they have them. "We knew expenses [for training and competing in tennis] were crazy and we also knew we had athleticism in our family," Gayal explained of the thinking before the girls were born. The girls' father, Sly Black (the couple is separated), played Davis Cup tennis for Jamaica and ran track in the 1993 Pan Am Games while Gayal was an AAU swimmer and a high school runner. Her cousin was on the U.S. handball team in the 1988 Summer Olympics. And Pitts, Gayal's oldest daughter with her first husband, Frank (who passed away five years ago), was also a junior tennis champion who played briefly on the pro tour at 16 before a wrist injury caused her to change course. She is now in medical school in Tennessee. "We knew we were going to have a couple more tennis players," said Gayal, who met Sly while she was a manager at Rick Macci Tennis Academy and he was Macci's head coach and Nicole's hitting partner (he currently works with Hurricane out of his tennis academy in Boca Raton and has coached Sloane Stephens, ranked 13th in the WTA rankings). "Alicia got her name 'Tornado' when she was 3 and playing out of her mind," she said. "We couldn't believe how amazing she was and we knew then we had a champion. When the next one was born, we knew she could do it, too, and so her [legal] name is Tyra Hurricane." But raising champions was only a part of the strategy. Tornado and Hurricane are names for marketable athletes, but that's a big part of it nowadays, and if you can get a good, strong name, all the better. "I have a marketing degree . . . and I knew I needed to do something for them to stand out, and we thought it was cute," Gayal said. "[Tornado didn't like her name] a few years ago. Kids tease you. But now they understand it's marketing and it's very big to say a storm blew through the US Open. "It's great for everybody, for publicity. Greg Norman was the Great White Shark. Sir Richard Branson said you have to have a brand to use. We don't want them to be the next Williams sisters or those African-American sisters. They're Tornado and Hurricane so people can identify them as something other than the next Venus and Serena. And what better marquee above the US Open than 'Tornado and Hurricane Black?'" Sly said it was all a "part of the plan" when the girls were younger but that it made more sense as they got older. "It was a little joke, but it turned out to be a pretty big deal," he said. "Yes, Tornado and Hurricane are names for marketable athletes, but that's a big part of it nowadays, and if you can get a good, strong name, all the better." And good, strong athletes are even better than that, he said. "Arrogance is one thing, confidence is a whole other thing," Sly Black said. "I've coached a lot of top players, and when Alicia was 6, I was told by people in the game that she was the best 6-year-old they had ever seen in their life, so I had an idea. Me coaching them was the easy part because they're good athletes and they love tennis. They want to be out there all day long, and I knew deep down nothing but serious injury would stop them from working their way up." It would be too easy and probably unfair to write the Blacks off as typical stage parents. None of Gayal's three daughters has ever been sent to live at a tennis academy, for example. When Nicole trained at Bollettieri's, she lived at home. "They need kisses and hugs and to be told 'I love you' at night," Gayal said. Gayal Black said a friend paid for her airfare and let her stay at her home so she could watch Tornado in the Open final. And the Blacks said they have practical reasons for looking at their daughters' burgeoning careers so pragmatically. Gayal Black said she scrambles week to week trying to finance the tennis careers of her children, who are homeschooled. Tornado, whom friends and family call Alicia or Ali, turned pro last year, but her mother is still piecing together sponsorships and relying on the goodness of friends and sometimes strangers to finance travel to and lodging at both amateur and pro tournaments. Florida-based Involvedfan.com has helped solicit private donations for Tornado and other athletes in need in exchange for such things as memorabilia and hitting sessions. The USTA development program also helps with expenses. A friend paid for Gayal's plane ticket and put her up at her home in New Jersey, Gayal said, so that she could attend the Open final, and Tornado received a donation to pay the $30-per-racket stringing fee ($300 in all) during the tournament. "The economy was better when Serena and Venus got on board, so it was easier for them to get sponsors," Gayal said. "It's going to get easier [for us]. I think it will make a big difference as she continues to do well and not just because she has a catchy name." Gayal said she keeps the business side of things away from her kids as much as possible to alleviate any added pressure, and Tornado confirms this, saying, "I'm trying not to focus on that right now. I'm just playing tennis and hopefully money-wise, it will come along soon." Her biggest wish at the US Open? "I really wanted to meet Roger Federer, but I didn't get to," she said with a giggle. And what did she have planned if she had? "I'd probably just be speechless if I did. Maybe I'd give him a hug, which would be good enough for me." What would she say to Serena Williams if the two met? "Can you share your secrets of why you're so good?" Tornado said. But more seriously, she added, "I want to be myself and not Serena or Sloane. I want to focus on me right now." While she may not have always embraced her attention-getting name, Tornado's aggressive playing style certainly seems to fit it. "Off the court, she's definitely different, just a normal teenage girl who goes to the movies and hangs out with friends," said Lawrence Carpio, Tornado's current coach at L'Academie de Tennis in Deerfield Beach, Fla. "But everybody has seen her persona on court. She's pretty feisty, she gets pumped up, she's very intense, which is a good thing. It gets her going. You have to have a good balance." In addition to all the physical tools, Tornado Black's coach says she has an uncanny ability to "lock into" a match. 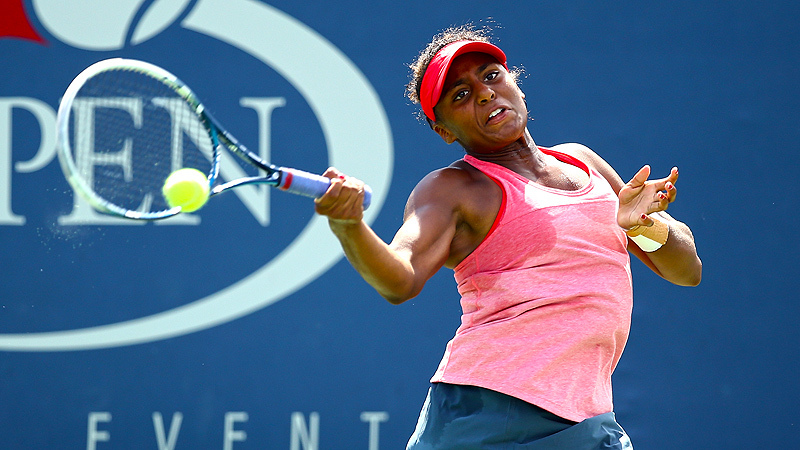 Gayal Black said she has noticed a dramatic change in her daughter since the US Open, where Tornado, ranked 21st in the junior ITF rankings, lost to No. 2 Ana Konjuh, 15, of Croatia. "Since she came back, her confidence is absolutely unbelievable," Gayal said. "I think it's more than just tennis. Just the whole situation of being in Times Square and playing in the finals in front of 5,000. Two years ago, she couldn't even talk to the media. She got tears in her eyes and just froze. "I was told she was a little overwhelmed at first this time, but every day she opened up more and more, so I think she grew not only tennis-wise but also as a person. She's like a whole new girl." Tornado said her success at the Open "motivated me a lot. It makes me realize if I work hard, I can be up in those stadiums. I used to not like [playing before big crowds] because I would get nervous, but I started to love it." While her serve tops the lists of things Tornado said she would like to work on, Gayal Black said there has been a conscious effort not to allow her daughter to go all out. "We planned way ahead with that," she said. "We really, really worked on fitness, getting to the ball, pushing off on the right foot. We taught all three of our girls to absorb power so you don't take it all in the shoulder and arms. "People say you need to serve bigger, but that's still not important to us. Save your shoulder and when you're 18, you'll be able to play a full schedule. Alexandra Stevenson [once a top-20 pro, now ranked 368th] and Maria Sharapova [the No. 3-ranked player, who dropped out of the US Open with a right shoulder injury] all have shoulder problems. And we went through that with our oldest daughter. When they're 18 or 19 and need a serve, they'll have a serve." Nevertheless, Gayal and Tornado's coaches are all in agreement that Tornado needs to take "the next step." 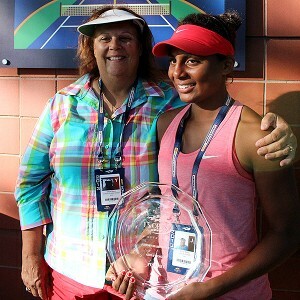 Gayal Black says her daughter has been demonstrating a newfound confidence since her run at the US Open. "She has always been a very fearless competitor and has always known what she wants to be. She's very clear on this," said USTA coach Freddie Rodriguez, who has also worked with Tornado over the past two years. "[The Open results] definitely showed her she can do it. 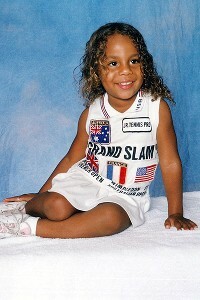 She beat the best juniors in the world. "But to go the next step, she is going to have to take her body to the next level and that takes time. Having a fitness team to do this and pushing herself every day, that's going to be key. I do think she has a great mind for the game and she moves incredibly well, which is a big plus in women's tennis. It's just putting everything together and having everyone on the same page. "It's time for her to go at it, but I think she's ready. You can't force it, though, it has to come from the player." Tornado said she wants to play more pro tournaments (she plans to play the $10,000 Amelia Island Women's Championships this weekend) and hopes to climb to the top 10 in the ITF rankings. Tornado also lost to Konjuh in the second round of the Open juniors last year, and in her only other Grand Slam experience, she lost in the first round of qualifying at this year's Wimbledon before reaching the Open finals. "This was a big step for her because while she has always believed she is one of the best players out there, this kind of opened her eyes to the possibility that she really is," Carpio said. "It's one thing to think it and it's another to beat the best players out there." Rodriguez said he can see signs of greatness. "She has an ability to lock into a match and when she does, she doesn't let go," he said. "If she learns to lock in consistently, then it's very scary because girls actually struggle to win points against her. I've never seen a girl win so many sets 6-0."